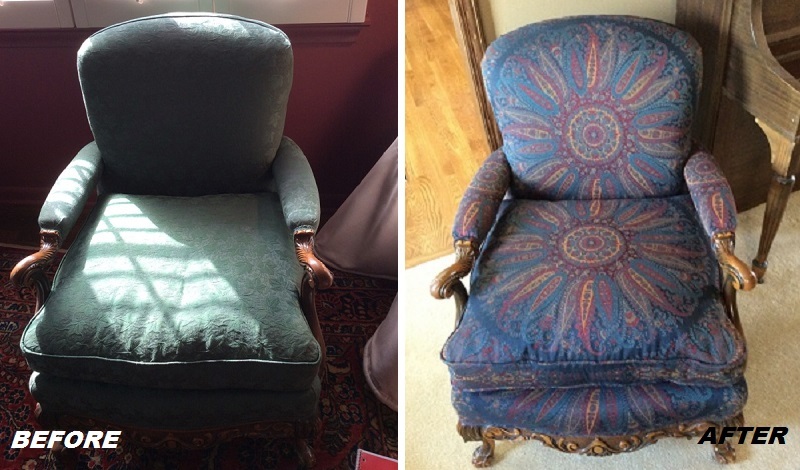 Reupholstered Accent Chair - Sew What? Sew Anything! - Sew What? Sew Anything! On this reupholstered accent chair the wood carved arms, legs and apron on this chair really pop against a very bold fabric selection. The scale of the chair seat and back were considered with this fabric. Notice how the careful placement of the fabric design works from the back all the way down to the front apron. While the after picture was snapped before it left our home workroom this is one piece that we know will own a spot center stage in its home setting.